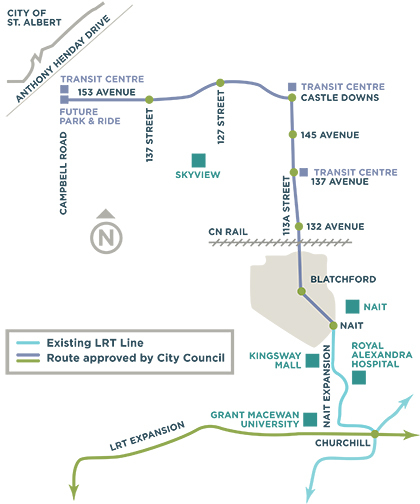 The Metro Line is an extension from Churchill LRT Station in downtown Edmonton to Campbell Road near St. Albert and is part of the Transportation Master Plan’s vision to expand LRT service to all sectors of the City by 2040. The Metro line is being built in two stages. Metro Line Northwest is in the Concept Phase which includes public engagement that's fully integrated into the planning process for concept validation and preliminary engineering. Metro Line North opened September 6, 2015 and runs from Churchill LRT Station in downtown Edmonton northwest to NAIT. The Metro Line from Churchill Station to NAIT station is operational. Find out the schedule, how to transfer over from Capital line and where you can go. Building a new LRT line is a significant infrastructure project that can take several years of planning, engineering and public engagement before construction can begin.